C5421 carbon fibre cord. Sometimes referred to as ‘braid’, carbon fibre cord consists of eight separate strands of individual carbon fibre braided together. The fibre is manufactured so that when cut the ends resist unravelling. The fibre density is about 1.6 g/m. C5461 carbon fibre, fine strands (unwoven). Can be used on Emitech "K" series of carbon coater, but not recommend for Quorum "Q" series. Note: Quorum Q series coaters (E and ES versions) are supplied with 1 m of C5421. Available in 3.05 mm diameter or 6.15 mm diameter sizes (depending upon coating system). 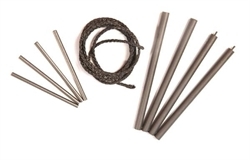 Carbon rods are typically used for evaporating (and sometimes shadowing) carbon onto specimens being prepared for either x-ray microanalysis (EDS or WDS) or transmission electron microscopy (TEM). Carbon rods supplied by Quorum are high purity - spectroscopically pure - with less than 6 ppm ash. Carbon rods are supplied in a flat-ended format and should be shaped using the Quorum 13232 carbon rod shaper. A word of warning: do not be tempted to use a pencil sharpener as process control and quality will be poor! The 13232 is designed to cut an end spigot of precise diameter and length to ensure optimum control of carbon thickness and quality. The 13232 is designed to shape 3.05 mm and 6.15 mm carbon rods with either a 1.2 mm diameter spigot (blue knob) or a 1.4 mm diameter knob (red knob).